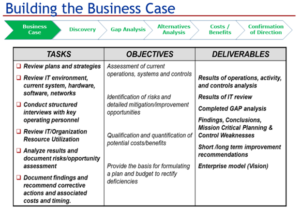 HomenewsThought LeadershipWhy Build a Business Case for ERP? Abstract: ERP solutions are 15 year+ solutions. What you have may be old and in need of replacement but a technology swap is not the only reason for a replacement project. The new system can help support you strategy for moving your business ahead into the future. A business case copares the costs and benefits of the project to show that it is more than just a technology project, it is a strategic project. If you’ve read our publications criticizing unrealistic benefits used to justify ERP, you may ask yourself why we are also advocates of doing a business case. It’s often very difficult to quantify financial benefits of implementing an ERP system. A business case for ERP is comprised of identifying functions within the new system and processes which will address legitimate gaps in your existing systems. The specifics of which are unique to each enterprise. You examine the daily requirements your existing systems support, consider where you want to take the enterprise in the future and what new requirements this exposes, place a cost and a benefit value on each area, determine how much disruption and benefit the organization can accommodate now, translate this into your systems search requirement, and gain executive approval to move forward. As you move forward with the selection/search, you update the business case periodically. Because of what your search may reveal about what is available from new ERP’s, you may shift your project short term strategy by adding or deleting functions or modules. Only you and your team understand fully how the gaps impact your organization and also the obstacles they could create as you continue into the future. This is true whether you are a static, slow, or a fast-growing company. The environment in which you are doing business is changing and the systems are adapting to these new business requirements and also helping to drive the creation of yet more business capabilities. Finally, it is not necessary for a new ERP to be the end all to replace all. 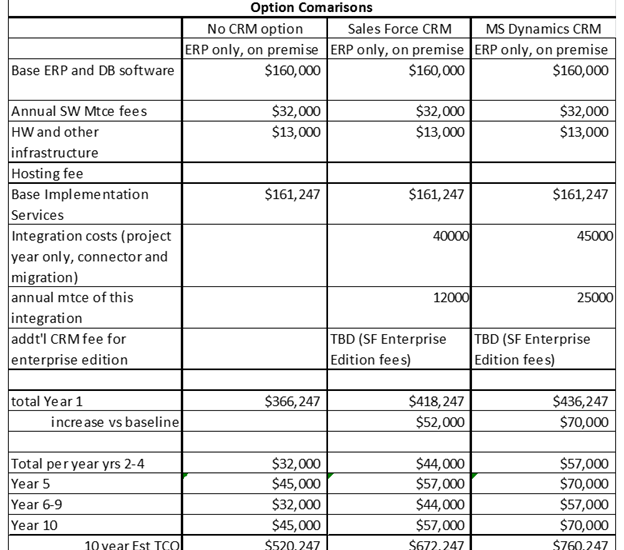 Some business functions ERP systems handle only in the most basic ways; e.g. trade promotion management, protein deconstruction, transportation management, producer payroll, etc. We have published in our Resource Center The Solution Ecosystem for Food & Beverage Manufacturing. In this ecosystem, we describe the different systems that may be needed by your enterprise yet are not handled in any functional depth by most ERP solutions. Please review our other related articles, specifically; Challenges Cost Justifying ERP in F&B and Key Factors for ERP Business Case Success. For more information about using a consultant to help with software selection, see our previous post titled The Smart Software Selection Consulting Decision. Last, if you have any questions about building a business case, enterprise systems available to assist with enterprise capabilities in food and beverage manufacturing, please contact us at gburns@glbinc.com or 630-303-2282 or 630-481-6340. Click here to be directed to the Executive Food & Beverage Forum in LinkedIn. We are co-founders of this forum and it has grown to over 500 high caliber members in just a couple of months! These members are all available for questions, and are posting excellent content regularly.